From the Naruto collection by Bandai Tamashii Nations. Naruto Shippuden Rock Lee SH Figuarts Action Figure. From the Naruto collection by Bandai Tamashii Nations. 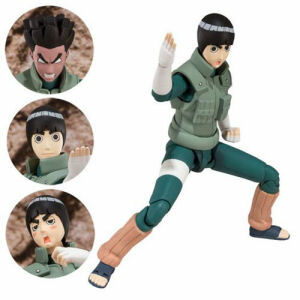 Naruto Shippuden Rock Lee SH Figuarts Action Figure. Complete set includes 6 interchangeable hands - 2 interchangeable face parts - an interchangeable head - interchangeable leg parts. Measures approximately 5.5 inches tall. Ages 15 and up. Bandai Tamashii Nations Naruto Action Figures shipping from Canada. No Surprise Border fees or Customs!